شاخص‎های زمین‎ریخت‎شناسی زمین‌ساخت فعال، ابزار مفیدی برای بررسی تأثیر فعالیت زمین‌ساخت در یک ناحیه است. محاسبه این شاخص‎ها به وسیله نرم‌افزارها، بررسی‌های سنجش از دور (به عنوان ابزار شناسایی) و به منظور بررسی اجمالی یک منطقه بزرگ از دیدگاه ناهنجاری‌های احتمالی مرتبط با زمین‌ساخت فعال سودمند است. این روش به ویژه در مناطقی که کار مطالعاتی کمی روی فعالیت‌های زمین‎ساختی آن با استفاده از این روش صورت گرفته است (حوضه آجی‌چای)؛ می‌تواند روش نو و مفید باشد. بر اساس مقادیر شاخص طول- شیب رودخانه (SL)، عدم تقارن حوضه زهکشی (AF)، انتگرال هیپسومتری (Hi)، نسبت پهنای کف دره به ارتفاع آن (Vf)، شکل حوضه زهکشی (Bs) و پیچ و خم پیشانی کوهستان (Smf)، شاخصی به نام زمین‎ساخت فعال نسبی (Iat; Index of relative tectonics) حاصل شد که ترکیبی از شاخص‌های بالاست و خود به چهار رده تقسیم می‌شود. 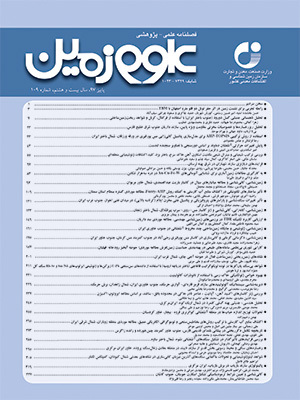 مقادیر به دست آمده برای Iat در منطقه مورد بررسی نشان داد که، رده 2 (بالا) با مساحت 46/1045 کیلومتر مربع 26/11 درصد، رده 3 (متوسط) با مساحت 67/2940 کیلومتر مربع 67/31 درصد، رده 4 (پایین) با مساحت 30/5297 کیلومتر مربع 06/57 درصد از کل منطقه را اشغال می‌کند. الگوی تقارن توپوگرافی عرضی (T) نیز برای ناحیه مورد بررسی محاسبه و نتیجه آن به شکل نقشه‌ای از بردارهای T تهیه شد با مقایسه این شاخص با نقشه رده‌بندی زمین‌ساخت فعال نسبی تطبیق نواحی رده بالا با پهنه‌های دارای مقادیر بالای عدم تقارن تأیید شد. Geomorphic indices of active tectonics are useful tools to analyze of the active tectonics in a large area. These indices have the advantage of being calculate from the software and remote sensing packages over large area as a reconnaissance tool to identify geomorphic anomalies possibly related to active tectonics. This is particulary valuable in Ajichai basins where relatively little work on active tectonics based on this method was done, so this method is new and useful. Based upon valuable of the stream length-gradient index(SL), drainage basins asymmetry(Af), hypsometric integral (Hi), ratio of valley-floor width to valley height (Vf), drainage basins index shape (Bs), and index of mauntain front sinuosity (Smf), we used an overall index (Iat), that is a combination of the other indices that divides the landscape into four classes of relative tectonic activity. The moderate class of Iat is mainly in the class 2 (high), with 1045.46 Km2 ,11.26 percent, class 3 (moderate), with 2940.67 Km2 ,31.67 percent and with 5297.30 Km2 ,57.06 percent occupying of all zone. The stream network asymmetry (T) was also studied using morphometric measures of Transverse Topographic Symmetry. Analysis of the drainage basins and sub-basins in the study area results in a field of T-vectors that defines anomalous zone of the basins asymmetry. A comparison of T index clearly consist with the values and classes of active tectonics indices and the overall Iat index. معماریان، ح.، 1380- زمین‎شناسی برای مهندسین، انتشارات دانشگاه تهران، صص. 49 تا 126. Azor, A., Keller, E. A. and Yeats, R. S., 2002- Geomorphic indicators of active fold growth: South Mountain-Oak Ridge Ventura basin, Southern California. Geological Society of America Bulletin 114,745-753. Berberian, M. and Arshadi, S., 1976- On the evidence of the youngest activity of the North Tabriz Fault and the seismicity of Tabriz city. Geol. Surv. Iran Rep, 39, 397-418. Bull, W. B. and Mc Fadden, L. D., 1977- Tectonic geomorphology north and south of the Garlock fault, California. In: Doehring, D. O. (Ed). Geomorphology in Arid Regions. Proceedings of the Eighth Annual Geomorphology Symposium. State University of New York, Binghamton. pp. 115-138. Bull, W. B., 1978- Geomorphic Tectonic Classes of the South Front of the San Gabriel Mountains, California. U.S. Geological Survey Contract Report,14-08-001-G-394,Office of Earthquakes, Volcanoes and Engineering, MenloPark, CA. Cannon, P. J., 1976- Generation of explicit parameters for a quantitative geomorphic study of Mill Creek drainage basin. Oklahoma Geology Notes, 36(1), 3-16. Cox, R. T, 1994- Analysis of drainage- basins symmetry as rapid technique to identify areas of possible Quaternary tilt-block tectonics: an example from Mississippi Embayment, Geological society of America Bulletin 106, pp 571-581. El Hamdouni, R., Irigaray, C., Fernandez, T., Chacon, J. and Keller, E. A., 2007- Assessment of relative active tectonics, southwest border of Sierra Nevada (southern Spain). Geomorphology, 96, pp, 150-173. Hack, J. T., 1973- Stream-profiles analysis and stream-gradient index, Journal of Research of the U.S. Geological Survey1. pp, 421-429. Hare, P. W. and Gardner, T. W., 1985- Geomorphic indicators of vertical neotectonism along converging plate margins. Nicoya Peninsula, Costa Rica. In: Morisawa, M.,Hach, J.T (eds). Allen and Unwin, Boston, 75-104. Hessami, K., Pantosti, D., Tabassi, H., Shabanian, E., Abbassi, M. R., Feghhi, K. and Solaymani, S., 2003- Paleoearthquakes and slip rates of the North Tabriz Fault, NW Iran: preliminary results. Annals of Geophysics. Keller, E. A., 1986- Investigations of Active tectonics: use of surficial earth processes. In: R. E. Wallace. Editor, Active tectonics: impact on society, National Academy press, Washington,Dc (1986), PP, 136-147. Keller, E. A. and Pinter, N., 2002- Active tectonics: Earthquakes, Uplift, and Landscape(2nd Ed.). Prentice Hall, New Jersey. Mayer, L., 1990- Introdaction to Quantitative geomorphology prentice Hall, Englewood, Cliffs, NJ. Molin. P., Pazzaglia, F. J. and Dramis, F., 2004- Geomorphic expression of active tectonics in arapidly-deforming forearc, sila massif. Calabria, southern Italy. American Journal of Science304, pp, 559-589. Moradi, A. S., Hatzfeld, D. and Tatar, M., 2011- Microseismicity and seismotectonics of the North Tabriz fault (Iran). Tectonophysics, 506(1), 22-30. Pike, R. J. and Wilson, S. E., 1971- Elevation-relief ratio, hypsometric integral and geomorphic area-altitude analysis. Geological Society of America Bulletin 82, pp, 1079-1084. Ramirez-Herrera, M. T., 1998- Geomorphicassessment of active tectonics in the Acambay Graben, Mexican volcanic belt.Earth Surface Processes and landforms23, pp, 317-332. Rockwell, T. K., Keller, E. A. and Jonson, D. L., 1985- Tectonic geomorphology of alluvial fans and mountain fronts near Ventura, California. In: Morisawa, M. (Ed.) Tectonic Geomorphology. Proceedings of the 15th Annual Geomorphology Symposium. Allen and Unwin Publishers, Boston, pp, 183-207. Silva, P. G., Goy, J. L., Zazo, C. and Bardajm, T., 2003- Fault generated mountain fronts in Southeast Spain: geomorphologic assessment of tectonic and earthquake activity. Geomorphology 250, pp, 203-226. Solaymani Azad, S., Dominguez, S., Philip, H., Hessami, K., Forutan, M. R., Zadeh, M. S. and Ritz, J. F., 2011- The Zandjan fault system: Morphological and tectonic evidences of a new active fault network in the NW of Iran.Tectonophysics, 506(1), 73-85. Strahler, A. N., 1952- Hypsometric(area-altitude)analysis of erosional topography Geological Society of America Bulletin63, pp, 1117-1142.